Easy to make, this light, cool ,creamy, pie is the perfect any time of the year dessert. 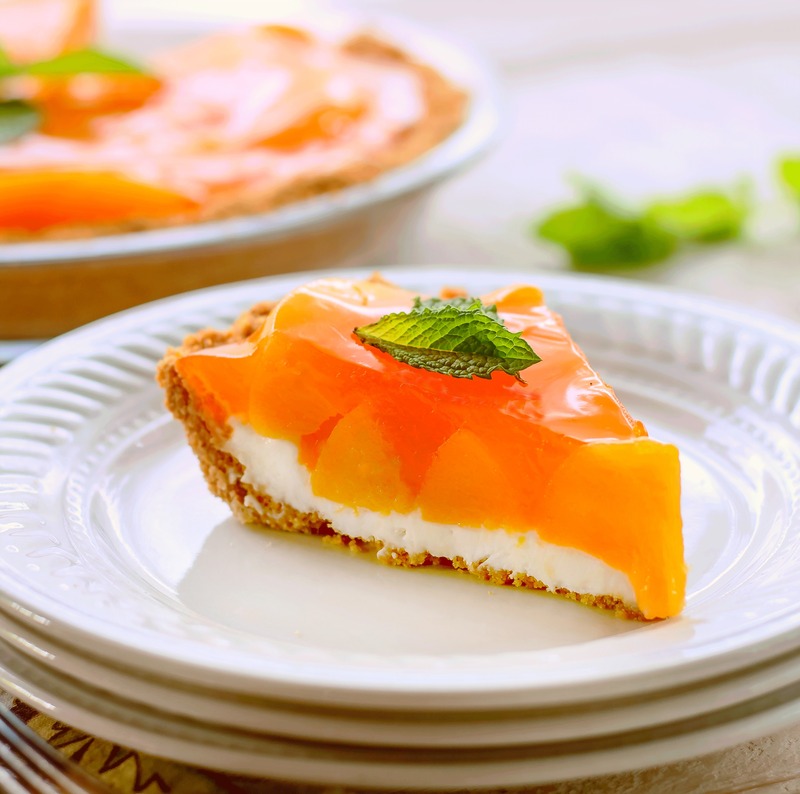 The graham cracker crust, cream cheese layer, peaches and topping come together perfectly to make one luscious treat. We start the recipe using a graham cracker crust. I made a homemade crust but a nine inch pre packaged crust will do just fine and save you some time. The first layer of the pie is made of cream cheese and a small amount of whipped topping. That layer gets spread onto the bottom of the crust. Be careful spreading the cream cheese layer, it will pick up some of the graham crackers as you spread if your spatula happens to touch the crust as you’re spreading. Canned peach slices that have been drained are arranged on top of the cream cheese layer to make the second layer. The third layer, which totally surprised me because I’ve never made anything like it before, is made of cook and serve vanilla pudding and peach gelatin cooked together on the stove and then spooned over the peaches. This is perfection…peachy, creamy summertime treat perfection. Enjoy! Creamy Peach Pie - Easy to make, this light, cool ,creamy, pie screams summer dessert. The graham cracker crust, cream cheese layer, peaches and topping come together perfectly to make one luscious summer treat. Place the cream cheese and confectioners sugar in a medium bowl, beat with a mixer until thoroughly blended. Fold the Cool Whip into the mixture until well combined. Spread into the bottom of the graham cracker crust. Place the gelatin and cook and serve pudding into a small saucepan, add the water, stir to mix thoroughly. Heat the mixture under medium to low heat , stirring constantly until it just comes to a boil. Remove from the heat, let cool 5 minutes. Arrange the drained peach slices on top of the cream cheese layer. Spoon the gelatin/pudding mixture over the peaches. Refrigerate the pie until well chilled. The Best Coconut Cream Pie EVER! I love it Mike! Thank you for taking the time to visit,I appreciate it!